When you need extra security and a wood door just won't protect, you need a ProSteel Vault Door. 3 steps make it easy to get your door. 1 - Select your door. 2 - Get a quote. 3 - Buy your door. Get the security, appearance, fire protection and ease-of-use details of your ProSteel Vault Door. The most versitile shelving system available. Store 42% more long guns with our door panel. The only scope saver in the gun safe market. Check out the industry leading interior in the Browning ProSteel Gun Safe. 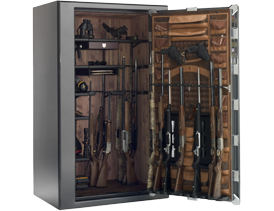 Learn about the gun safes we offer and then find the Browning ProSteel gun safe just for you. Tornados can strike anywhere and anytime. ProSteel Tornado Doors are FEMA 320 compliant to help protect those in Tornado Alley or where ever storms occur. Get the security, appearance, fire protection and ease-of-use details of your Tornado Door. The patented rectangular MAX Locking Bolt has 12-times more surface area and is up to 4-times stronger than traditional round bolts giving your safe MAXimum security. Check out the industry leading security features on Browning ProSteel Gun Safes. Protect your home, office or business. 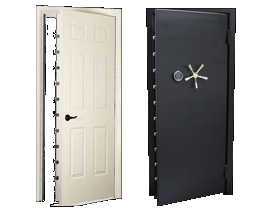 Our highly engineered steel residential and commercial security doors, vault doors and tornado doors will keep valuables in, people out and you safe. ProSteel made one of America's first gun safes. Now Browning is the exclusive distributor of ProSteel made gun safes, branded as Browning ProSteel Safes. The steel Vanguard Tornado and Security Door is built around 6 locking bolts and is FEMA 320 compliant. Tested to withstand the winds of a tornado, the Vanguard door can protect your family and valuables. Check out the ProSteel Vanguard Security and Tornado Door and see how industry leading Security, Appearance, Fire protection and Ease-of-use features make ProSteel doors the ones that keep you SAFE.